This morning, the Jays acquired CF Colby Rasmus from St. Louis, picking up one of the best available talents in a three team deal. Undaunted, the M’s got to work and signed OF/DH/COMEDY Wily Mo Pena, who’d been cut by the Diamondbacks a week ago. Pena was out of affiliated ball for a while, then bounced back in 2010 after signing with the Padres and playing in the PCL for Portland. This year for Reno, all he did was hit .363/.439/.726. Yes, Reno’s a bandbox, but he hit better on the road. Yes, the PCL is suddenly a collective bandbox, but that’s still quite impressive. After Juan Miranda struggled, Arizona called him up for just shy of 50 plate appearances. He didn’t draw a walk, struck out often, and hit five homers. As he’s a defensive liability, that wasn’t enough to maintain the D-Backs interest. They’re in a vastly different situation, as they had a 1B trapped in AAA (Brandon Allen), and another 1B mashing in AA (Paul Goldschmidt), and they play in the National League. Pena’s meant for the AL, and he’s meant for a team that’s not getting a lot of production from the DH spot (or any other spot). Pena’s only 29, and he’s been a lefty masher in the minors, but his MLB splits aren’t anything out of the ordinary. 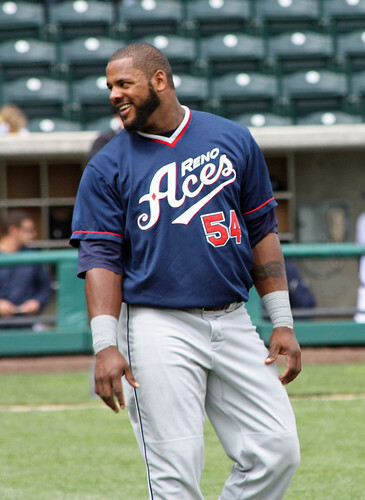 For the moment, he’ll head to Peoria for a bit while the M’s figure out how to fit him onto a AAA roster that includes DH Luis Jimenez, Carlos Peguero, Matt Mangini, Matt Tuiasosopo and Mike Wilson. Jeff at LL hypothesizes that he could replace Jack Cust as the primary DH. He could also platoon with Cust if the club wanted to commit to Carp in LF and move someone else back to Tacoma. This is a minor move; Pena hasn’t been an effective MLB player since 2007, and his eye-popping PCL stats didn’t exactly translate to the National League (see? It’s not just Mariners that do this). If the pick-up blocked someone, it’d be odd. But this is a no-risk, low-reward move that shows that the M’s are going to try their best to put a decent product on the field down the stretch. Pena is basically Carlos Peguero’s 99th percentile projection, but he comes to a team that’s repeatedly used an aging Adam Kennedy at DH, and which splits its clean-up spot between an enfeebled Justin Smoak and a catcher with an OBP in the .260 range. M’s fans are tired of watching the team struggle to score runs, and I’m tired of repeating that a call-up or waiver-wire flotsam HAS to be better than the incumbent in Seattle. So here’s to incremental improvement. Here’s to a guy who generates some excitement. Here’s to the team reminding me more of the 2004 M’s and less of the 2010 M’s, which is somehow, inexplicably, a compliment.